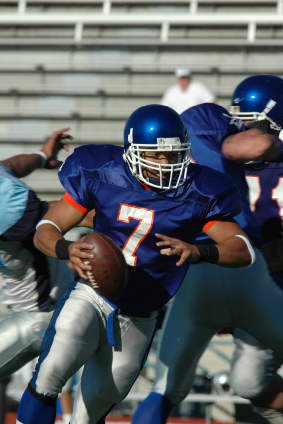 Changing the Quarterback’s launch point can really help bolster your passing attack. By using a mixture of quick passes, Play Action passes, and sprint game to attack the offense, you may be able to increase your completions. You will also help your running game by throwing the ball around and giving different looks! Coach Daniel and Coach Albaugh talk about the protection for these types of passing games. In addition, we look at route combinations and how to use your passing attack to improve your offense. Nate Albaugh: And I’m Nate Albaugh. Joe Daniel: And you’re listening to the Football Coaching Podcast. And this is episode 10. We’ve made it a long way. I’m surprised. Nate Albaugh: Wow! Yeah, it went fast. Joe Daniel: Yeah, it has, really. Today, looks like we’re talking about, we talked about drop back passing last time, today we’re talking about kind of moving that launch point for the quarterback and protecting for play action passes spread out, things where were getting the quarterback on the move. And definitely, as much as, our team does more drop back passing, we talked about it last week. I think you’re probably a little more versed on the play action to get us back on the move here. Nate Albaugh: Yeah, that’s really all we do. We don’t do anything I really consider drop back passing. We do a ton with our quick game. We’ve gotten so much mileage out for our quick game. It has amazed me that no one else we played uses it. That we get a ton of mileage out of it, I don’t really consider it drop back passing because it’s literally one step and ball’s gone. So it’s our quick game and then we got our play action game. We live and die by that, that’s all we do. I just had never felt like the level of athletes that I have are capable of a true drop back scheme. Joe Daniel: With your quick game, we’ll start there, we use a quick game, we actually vertical set a quick game. It’s a little bit different. Last year we did two, you know we talked about last time we do 4 steps, inside outside, inside outside, for a regular drop back. Last year, we counted down to 2 steps for our quick game or we just cut. So when you say quick game, how are you protecting it? What kind of routes are you throwing? Nate Albaugh: So they let it go? Joe Daniel: Yeah, they let everything go. Nate Albaugh: In ours, you cannot get away with cutting right where we are. I mean for the life of me, I’m so done. So we will literally just come off the bombs, snap at the ball, my offensive line attacks and they’re taught to attack one yard forward. So all of my guards they step in and forward. My tackles have to really come hard because they’re kind of losing twice as much space since the guards are gap stepping in. They have to really have to take a giant step in and forward and then I had two backs coming off the edges, my full back on one way, my tail back going the other way, my half back since we’re mostly a wing-T type set, and they attack at that last man on one scrimmage. And their goal, their job as we teach it, is to put a shoulder through their gut. You know, try to poke a hole into the guy’s gut with their shoulder. And that has worked for us in helping get those arms, those hands of that defensive end or outside man, back. So the very first time, generally, that guy will come through and he’ll try to throw his arms up, but you know, when you get a guy who’s ramming his shoulder pads into your ribs, they come down a little bit, that’s all there is to it. You know, it’s the same effect that the cut will do is that you’ll get your hands down if you’re cutting the guy. Since I’m not cutting, we’re going to throw our shoulder to that guy’s gut; that’s what our guys are backs are tossing. Really attack the line hard our backs right off the edge of our guys that are gap stepping in. We’ve got balls in those protected. And then my quarterback literally takes one giant steps of my quarterbacks in righty. He’s going to dig step with his left foot back; one giant step back. So it’s a very abnormal big giant step back. He reaches with that left foot back, sets the right foot and throws. And we live making living on 4 pass plays; 4 pens. The first is our quick fade and from our wide receiver. If we get a guy that is, let’s say, 6 yards off and is really playing the inside or we get an outside linebacker that’s really getting nosy on like a hitch, we’ll run our quick fade. Our quick fade, we take one step at the inside linebacker as wide receiver, one step at the inside linebackers, and then you literally draw a straight line between you and the quarterback and you run away from the quarterback. So a bubble would be you’re just going to basically plant your feet and kind of bubble back, you get some depth. This, you get no depths, it’s a forward pass and you literally draw a straight line between you and the quarterback and you run away from it. So you end up catching the ball about 2-3 yards of depth. What we love about our quick fade is that now my receiver is catching the ball under one arm on the run apart. Whereas when you catch it with a hitch, your feet are stopped. Now I’ve got an athlete catching it on the run. And number two is that he can actually see his defender. So our quick fades, when we get our quick fades, we’ve had a great deal of success so that being about 10 yards a pocket. So when the guy is overplaying it, so the corner sees the quick fade coming, he quickly tries to run towards that side as well. My receiver will catch it and the second he catches it, he could see his defender, he’ll stick the foot and plan to cut right inside your corner and he’ll get upfield. And then if your corner is lagging, kind of still behind him, he just keeps the jets on and runs to the sideline. So that’s been a great play for us. The second play we throw from there is a hitch. We’ll throw a hitch if we feel like we have plenty of space. So if they’re even softer, we’ll throw a hitch and we’ll also throw the hitch really so that we can eventually set up a hitch and go. Or also we’ll have our hook and ladder. Are you guys familiar with, you guys call it hook and ladder down there or anything different? Joe Daniel: We do, we call it the hook and ladder. We actually ran it successfully. We are the only team to ever successfully complete about five hook and ladders; about one a game after we put it in and get walked every single time. We did that one season. I think we’ve gained about 12 yards average on them. Completed a hitch and a ladder and got about 12 yards out of it. Nate Albaugh: Well, we like to throw a hitch because it has been good to us as well but it also steps up those other things that we think are potential bigger plays. So we throw the hitch and then the last two that we make a living out of all one step are the fade and our fade has been very good to us, we do throw it to a spot and the way we’re aiming for 20 yards away over the outside shoulder. But the reason why I feel like our fade has been a little bit more successful is that it has not been we don’t throw it as a jumpball. We do not consider the fade a jumpball. We teach our kids to run upfield vertically for 5 yards. He’s going to make a slight outward break to make it look like he’s going deep. Then as he finds the ball at the last second, he fades away to it, if that makes sense. So a lot of times on a fade, a kid will take a plant step and he just run into the sideline. And that gives a good corner a chance to run to the sideline too and get it. Along this and stay it’s kind of pressing vertically, staying close to the corner and then at the last second, he fades away from him. So it’s all been very good to us. And in the final play, that has been great for us out of our quick game, is what we call our, basically it’s an underthrown fade. So we will call it to underthrow it and now instead of aiming at 20 yards, it gets thrown at 15, and our receiver kind of take and it’s thrown with a lot less arc and our receiver takes that fade beginning and then at 15 yards he just kind of breaks it off and it’s thrown back shoulder and it has really hurt people foreplays and we make a living out of it. Honestly, we’re pretty consistent. Once we’ve got it down with the kid personnel that I had. For example (I know I’m talking a lot and I’m gonna stop soon), when we first started quarterback and a receiver combo, it takes us a couple games to get the timing down with those kids. But once we had a quarterback and a good receiver combo that are comfortable with each other, we really are not happy unless we’re throwing our quick game for about a hundred yards a game. And so that has been very, very good to us for so many years and every year, I’ve had one great receiver and we throw it to the one great receiver. We don’t really mess around too much throwing it to a kid who’s okay. We’re going to find who’s your best, that’s our best, that’s who we go to in our quick game. So that’s our quick game for us. And again it is super quick. One step, it’s gone. I wonder if some other teams are maybe just trying extend it too much; you know, 3-step drop, you’ve got some if-thens in there. I’m not sure what the hiccup has been with other people or if maybe they feel like it’s too simple it shouldn’t work. What are your thoughts on there? Joe Daniel: It’s extremely simple, it seems like it shouldn’t work just based on that. Obviously it sounds like it works and it makes sense, it makes complete sense when you think about it. We do throw some one step stuffs, of course we’re in shotgun most of the time so it’s just a gathering throw for us. And still the timing is still essentially a 3-step. We’re in shotgun so we get the snap, we gather step and throw. Upfront we’re doing our quick set; we call our quick set which is just 2 steps instead of a 4-4-step vertical set. Ball’s out, we throw a hitch, we throw a fade, we throw our slants, same kinds of things. I don’t know, as long as you’re getting coverages. Now my question would be, what if you get, say, a press corner out there? Does that change or do your convert the route? Nate Albaugh: That’s a very good question. What we have done, once we have a combo of kids that feel good and work well with each other. We usually call, see our quick game is our 90’s game, we call it our 90’s, and we will call check 90’s. So now the kids have the opportunity to call what they want at the line through a series of hand motions or gestures. They will call things up the line. Now what we found is we don’t get press very often and I think that’s probably because we’re a wing-T team and we don’t’ throw that much, we don’t throw more than 15 times a game. So we hadn’t seen much press coverage but we have seen some. And what we’ve found is we have gone to we will run a slant form where we get press; we will run a slant a fair amount and with one step to the slant. And what has been the most successful for us against the press coverage has been that underthrown fade. We’ve really hurt press coverage with that underthrown fade and with the fade itself. So obviously you’re not going to run a hitch against press coverage but we haven’t got a ton of it. But again, at my small school that I coach at now, I’ve had 3 seasons there as a head coach and we have never once been pressed. In my one season at Alton, where it was a suburban school by St. Louis, a lot of loud speed there, very big high schools, one of the biggest classifications in Illinois and we got pressed two of our nine games. So for whatever reason a couple teams thought they could press us and we hurt both teams with fade and underthrown fade. It’s been good to us through thick and thin. Joe Daniel: Yeah, it sounds like it. Sometimes it’s simple, obviously doesn’t cause you a lot to install that. You know you get it in, and like you said it’s just the timing from that point. You teach somebody to run those 4 routes and your protection is not changing, it’s simple to install, it doesn’t sound like it would take a long time to put the protection in and you’re rolling. So it’s a pretty solid plan there; pretty solid quick passing game. Nate Albaugh: You know what, maybe I think you’re right. I think there could be a lot of it. it’s that there are so many shotgun team now; that the second you snap the ball in the gun, so many variables are there and the timing is different and you can’t get it out as quick as we’re getting out. So that could be some of the drawback to running the quick game the way we’re running it. Joe Daniel: Now how many receivers you have out at that point, in that route? I know you’re saying, you’re throwing this one and you’re throwing it so quick it doesn’t matter. Do you have any other options on the receivers? Or is it just you’ve got this one great receiver and he’s going to get the ball? Nate Albaugh: Well, what we’ll do is we could be in a pro type look from the wing-T or in our wing in one split. So we can have 1 to 2 receivers split and we will always have 3 receivers and routes. We always put our tight end in route; he’s going to run unseen. We always put our wide receiver, the other wide receiver, on the other side and route. He runs the mirrored route of our X. So there are other options. But I’m going to tell you this, we’ve been running it for 4 years and all of my quarterbacks have understood this: throw it. Joe Daniel: Throw it if you’re throwing it for a reason, yeah. Nate Albaugh: We throw it. And then 4 years we have had, I believe, these are my estimates on sacks, I believe we’ve been sacked three times in 4 years and we have had it intercepted one time. And the only time we’ve gotten intercepted in 4 years on our quick game was when it got batted by the defensive end and went straight up in the air and the linebacker was able to come down. So it has been extremely a success for us. And honestly, because I’ve been working on this on a book, kind of about what we do to throw the ball and I’m sitting there going “Do I really”… I’m worried that someone else I got to play picks it up and runs it the way we do because it’s been so good to us that I have been amazed; amazed that more people aren’t using it. Joe Daniel: Yeah. It’s funny how as simple as this little thing that’s been so… it seems so simple but you get so much mileage out of it. Now as far as you also do some other things with your quarterback besides your quick game, do some I guess play action type stuffs as well? Nate Albaugh: Oh absolutely. We’re going to… we run the waggle, everybody should. Everybody used to have the waggle; so we run that and we rep the heck out of it. It wasn’t our number one play action play last year but it is always number one priority because we need it to be… it has that potential to be that number one play. And what I found in my first year or two coaching was that I bailed on the waggle too early. And I think it must have happened with a pretty good amount of coaches because I don’t see as much waggle as I think I would. You know when you listen to these clinics and you hear guys talk, they will tell you, I’ve heard on several occasions, waggle has to be the number one play on football. I don’t know if you’ve ever heard anyone say that. Joe Daniel: Oh yeah. Every speaker I’ve ever been to. Nate Albaugh: That’s right. Wing-T speakers say this is the number one in football. And yet even when we play wing-T teams, I don’t see it as much as I think I would. And I think it’s because it’s easy to bail on. It’s almost like you figured it should be automatic. Sometimes that drag can be harder to throw than you would think. Sometimes protecting it is harder that you would think. I think maybe people bail on it too early. And I know I was guilty of that my first two years; even a little bit in my third year. Last year we stuck with it and finally, about halfway through the season, our kids started to really get cool with it. We got started with those kids back. So as we were in the system, I guess they could pick up the waggle more. And then our final thing we do with our play action was, this is how we protect it, we’re gonna go on the front side. This is where we will run like a sprint out out of this protection. We’ll run a little half roll and we will run up our basic, like play action drop straight, almost like a straight drop after our play action, although we only have one play that matches up to it. We’ll use this play action for everything else and that is on the front side, our tackles gonna go, his rules are gap, man on, man away; so in that order, gap, man on, man away. You guard plays gap, man on, man inside. And then your center guard and tackle, they’re all doing that back side turn back protection; so I don’t know if there’s different names for them. So we’re gonna fire step and be your turn back protection. And that’s it; and that works for almost everything else. What I learned on my past couple years with throwing that play action had been the rest of our play action passes were that they are more successful as I begin to move the quarterback. If I try to leave the quarterback there in the middle, he was gonna drop straight back at whatever play action you have is you are much more susceptible to getting sacked. But if you put him on that roll, it’s almost like he’s closer to many of your options and he seems to just get the ball out quicker for whatever reason. I know we’re not getting more kind because we’re rolling him but we’re having more success as we roll him. And I think it might be because as he moves out of the pocket, he may be closer to that out-route that you had in there, he’s closer to that curl, and he seems to be getting the ball off quicker and we’re having less problems getting sacked. Because let’s face it, when you come to your play action game, how many of use gets so frustrated because you get sacked, and you get tired of getting sacked. So that’s what we live on on our play action game and I could be more specific as to specific plays that are good to us. But I think just first and foremost we just talk protection. I’m curious to know what you guys do, how you guys protect your play action game. Joe Daniel: It’s a little different. We do get the quarterback on the move. We do have a lot of… because of our backfield action, it’s very easy to just get a quick token play action which we find is… you know, we’re in the shotgun but we’re in the gun to run the ball. And in fact we’ll probably be more in pistol this year. And we’re in that look to run the football and it’s easy for us to get little just token play action without changing much of anything. But at the same time, on our true play action pass plays, with zone blocking, we’ll just run a play action off of our zone read, we’ll just take our zone steps. We tell all of our offensive linemen to take their zone steps, their back bends out. Either leave the back and take the backside end and we’ll roll away from him. Usually we don’t have anybody on that weak side B gap so we can step down and then turn back with the back side tackle. Everybody’s just basically taking their zone steps. And that’s an easy cheap play action protection. You zone and just don’t get into a double and drive him down the field. Everything else, you zone, you look at the guy that you would look at for zone, if a backer comes, pick him up; very basic, very simple. And that’s a simple play action protection for us. If we wanna get the quarterback on the move with a sprint out type of look, we’ll quickset and slide it. And what we tell our guys is to slide fast. So it’s just as a slide protection for us, we’ll bucket our backside tackle to pick up the defensive end if he doesn’t have anything in his gap. That’s how we get the quarterback on the move; we quickset with just 2 steps, vertical set, and then we slide. And we just slide fast. Nothing complicated about it. Getting the quarterback on the move, I think, has definitely been a good thing for us. To me, as a defense coach, when the quarterback rolls, now all of a sudden the linebackers have to think about more. If he’s sitting in the pocket, my outside backer’s not thinking about the quarterback. It doesn’t mean he can’t run but he’s definitely not worried about him. But I think we see so much of our outside backer, you think you’re getting sucked up on the play action or if he doesn’t then you’ve got a quarterback just running around out there. Everybody we play puts the most athletic kid on the field; a quarterback. Puts him in the gun and he runs the ball as much as anybody else and he sprints out. And if you don’t send somebody to respect him, he’s probably gonna get around your defensive end at some point and if you don’t send somebody out there to respect him, he’s gonna just take off. So I think that’s one reason we may seem more high percentage passes. You either get a run if there’s nothing he sees or you get somebody else coming out of coverage and now you’ve got an open player out there. Nate Albaugh: And that takes a toll on linebackers because they can’t be right. And that’s when they start to doubt the scheme. They start to doubt the system. They go, “man, I’ve been burned 5 times in a row, the heck with this. I’m gonna do the opposite”. And then you burn worse. I guess that’s why the game’s great. That’s why it’s a great game and a fun game to coach is that it’s not easy. Joe Daniel: We’ve had games where we play the wing-T team a few years ago who physically just, should’ve probably beat us, should’ve beat us like that. In the first half, i think, we were down 7 maybe. It was a very close game and literally beat us even though there were other athletes on the field who were much better athletes. They literally beat us because they figured out that between their quarterback and their running back and our Will linebacker and our outside linebacker, they could beat us. Because those two got our athlete, our outside linebacker, make him wrong every time. And that was it; that was the ball game. It wasn’t protection. It wasn’t schemed defensively. It was our outside backer was coined to be wrong. He was gonna jump the back and the quarterback was gonna take off. Or he was going to help on the quarterback and the quarterback was just gonna dump it to the back. It was just horrible 2-on-1 game that ended up happening. And probably some adjustments we could make but that’s how effective that can be for you and it’s amazing. Now percentage-wise in your offense with the Wing-T, how much are you using each one of these styles? You mentioned changing the quarterback’s launching point, getting him on the move. How much are you doing each one? I know the quick game is your biggest one. And how much compared to your run game? Nate Albaugh: I would say, for example, our last game of the year we were 12/15 throwing the football. I believe they were in their, it’s much easier to think of my play action passes because they are, I believe 8 of those were quick game and one waggle. And one of my basically a belly action keep pass; so one waggle, one belly action keep pass, so we rolled towards the tight end and wing and then two of our favorite, probably our number one play action pass this year, I told you, wasn’t our waggle, was a counter pass that we have. So I’m very sure that’s what our final game of the season was. So that’s a good look at what we do. We’re not always 12 of 15. If it’s windy, something like a 5 of 12. So we’re not always on fire. I’d like to think that we will always be on fire but we’re not always on fire. But again you could see when we’re 5 of 12, we throw a little less because I can pick up quickly. This isn’t as high percentage as I like this to be. I don’t think we’ve ever had a game where we throw the ball 20 times; I don’t think ever. But again, early in the season we threw them less. I think the least we’ve ever thrown was 3 times a game. So that’s kind of gives a feel of what we do. I would say we’re at least 75%. 75% quick game and we’ll try to go deep at least once a game. I was just reading a wing-T book or listened to a video and he said he tries to go deep once a quarter, once a quarter. To me, once a quarter, that comes up a lot. I mean really truly deep is, I get worked. First of all it’s hard to call. You get nervous when you go to call, you know. I think that might be part of the problem too of coaching football and why you don’t see maybe, especially the smaller school, you’re definitely coaching a different area and atmosphere than I am. At our small school level, you’ll be amazed at how many schools really are a little bit scared, maybe a lot of a bit scared, to start from football more than five times a game. I think maybe it’s a little intimidating to call because you’re gonna make love really when I come out and just chop this thing up. Joe Daniel: Well I’m sure it depends on the athlete that you have to. As much as we all want it, we know that we should take shots to back people off. We know that we should run a play action, run a draw, run a screen; especially, I’m sure to a small school. But we run into it too if your best football player is your running back then when your back’s against the wall, easiest to do is go hand it to him and go run. That’s what makes sense more than anything. I understand the hesitation. I’m more of a defensive coach but it’s the same hesitation you have with blitzing. Certainly you know that your kids know the base coverage and the base front the best. Then if you’re a running team they know your running play’s the best, they execute your running plays the best. And there’s obviously some risks, I don’t know if risk is the word but it’s different when you start calling pass plays, anyway. I was just reading a double wing book and I’ve got this strange obsession with the double wing lately; which is different from the wing-T but still a run base offense. And I thought an interesting point in there was to never throw the football when the defense expects you to throw the football. So his point was throw it on 1st and 10. Throw it on 2nd and 3. But as a double wing team, you’re a running team, run the ball on 3rd and 10. You’re probably not gonna complete the pass for third and fourth team. But you might complete one on first in ten when they’re expecting you to pound the ball and I thought that’s an interesting point from the perspective of play actions and those sort of “catch him off guard” passes. Nate Albaugh: And you’ll be amazed, I mean, when you look at my team, we definitely live by the same principle, the same theories. If you get us on 3rd and 10, odds of us throwing the ball, besides quick game, we may throw fair or under throw fade because that’s good to us but outside of that, we’re not gonna throw it play action pass because what do I know who is coming on 3rd and 10. I’m getting their absolute favored blitz is coming. When the game is on the line and you’re the coordinator and he’s 3rd and 10, you better believe here comes your number one blitz; you’re bringing it. And if you’re not bringing number one, you’re bringing your number two. So you’re bringing something and it’s probably pretty good and your kids are foaming at the mouth because it’s 3rd and 10. And I promise you right now we do not practice pass protection enough to pick up and stop you’re best blitz. We’re not going to stop it. So 3rd and 10, there’s a pretty good chance, and if you were in my conference plug your ears now, we going to run track. That’s what we’re going to do, we’re going to run track or we’re going to run our quick game because we can’t get away with anything else, we can’t. Because you’re best blitz will beat us. It will beat us unless we have the right call on as far as pass protection. Your best blitz will beat us 9 times out of 10. Joe Daniel: I’ve probably seen that inside track. We see very, very little wing-T. Once upon a time, everybody was in the I. When I first started, everybody was in the I, there were 2 wing-T teams and it was a fact that, I don’t know how your overtime rules are structured, ours they put the ball in the 10-yard line and you got 4 plays to score, it was just fact that every single team in our district was going to start overtime with a waggle. You knew it was coming, you knew that first play was going to be a waggle, you had just to defend it, it got caught halftime, but it was just known that that was coming. Today, we don’t see much of it but I’ve definitely seen those few true running teams or wing-T teams that we run into be just as successful or more so running the inside trap on 3rd and 10 or 3rd and 12 as the passing teams are with that same down and distance. Because I don’t think anybody really has an answer for it. But if you can block and inside trapping, get your guy going downhill when they’re not expecting it and you get some good head esteem and doesn’t meet anybody until 5 yards down the field, he’s probably going to make that 12 if he’s pretty good because everybody’s bailed out there. I think you’ve got some interesting ideas here and just talking a little bit of protection. I think we got off on some, we certainly got on some tangents; a really interesting quick game package that you have, definitely, so some new ideas there for me to look at for when I have some base to solve the wing-T; when that day comes. I’ve read it all the time. If everybody else were to suddenly up and quit, I would immediately install out of the wing-T, single wing or double wing; just depends on what decade I want to go to in the time machine. Nate Albaugh: You’ve got some good options there. Joe Daniel: Yeah, well I got a book on each one, I think. And that’s all you really need. You don’t have to actually have an experience coaching it if you have a good book (laughter). Nate Albaugh: Exactly, as long as you’ve got a couple of good illustrations. Everybody that writes a book seems to find a way to sound really smart. So you know you’re getting good advice. Absolutely. All I need to do is carry the book out on the field with me and show it to the kids, “this is what we’re doing”, and we’ll be ready to roll. You got anything new going on with ChiefPigskin this week? Nate Albaugh: A little bit of, I’m finally hitting the road again to shoot some more footage. Tomorrow, I’m heading Indianopolis, Marion University which I believe is in high school. They just started their football program 2 or 3 years ago and they’re winning. It’s exciting, I’m finally hitting the road again for ChiefPigskin and also working hard on figuring out how we can help get allow other to contribute footage to the site as well. So if you’re a guy out there that’s got an iPhone, you got a couple friends in the area that you know wouldn’t mind sharing and putting on ChiefPigskin, contact me, Coach Albaugh at ChiefPigskin.com. We’re just looking at kind of spreading out and me passing the torch a little bit. You know I’ve been working for 2-3 years now on shooting free footage for people and I’ve put up over 300 videos. It would be great if anyone out there that doesn’t live in Illinois could help us out and show us what football’s like in the rest of the nation. Joe Daniel: It’s becoming so easy to do it. I’ve just put up a video on Football-Defense.com yesterday. I’ve been getting lots and lots of people saying that they want to see drills, they want to see to go with 4-3 or 4-2-5 packages, they want to see drills, they want to see how you’re making these things happen. And I picked up a little Sony bloggy touch camera and I’ve just been filming our drill and practices. Maybe I’ll get some over to you. It’s been incredible benefit for us just to be able to actually watch film. We don’t have anybody to film our practice, nobody’s going to go out to set up a camera but to watch film for our guys to see themselves practice. But how easy is it to just film a drill or two and send them over so that other coaches can look at them too, I think will be a big benefit. Nate Albaugh: Absolutely. We’d love to have anybody that wants to share. If everybody out there shared 2 or 3 videos, we could really put a great resource together for coaches. Joe Daniel: Yeah, absolutely. Well, Football-Defense.com, I’d love everybody to stop over there if you haven’t been. Take a look at what we’ve got. We’ve got probably about 43 articles on the site and there’s over 200 articles in our membership section. They are from the past 3 years, updating about 2 to 3 articles a week there, and really just focusing in on getting the fire points of each defense. So we do talk 3-4, 3-5, 4-2-5, and 4-3 defense, as well as getting some of the other defenses, 46-pair. I even did a double eagle flex video which was interesting. I’ve never run it. It’s a lie (laughter). It’s all a lie, I’ve never run it; I got that one out of a book. Other than that, just stop over there at Football-Defense.com and check out the membership section as well as the free articles. And also, do also Football-Offense.com which is growing and doing very well. Big focus more on spread than anything else but I do try to branch out and look at some of the other things that, little pet projects when I get off on the wing-T, doing all sorts of stuffs and throw an article here and there about those too. So I think that’s it for us Coach. Nate Albaugh: Fantastic. It was a fun night talking football. I know when we have a show, when I’m sitting here wishing I could talk more and know it’s a good one. So we had a good one tonight. Joe Daniel: Absolutely. Appreciate it Coach and thank you all for listening to the Football Coaching Podcast.